Did you know that there is more to bergamot essential oil than giving off a nice aroma and flavoring Earl Grey tea? Bergamot essential oil has many health benefits and uses and it contains many powerful properties which have an amazing effect on both physical and mental health. 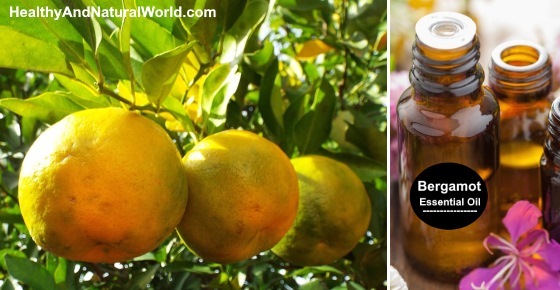 Bergamot essential oil is extracted from the fruit of the Citrus bergamia tree. As its name suggests, the bergamot tree belongs to the citrus family and it came about by cross-breeding the orange tree with the lemon tree. The tree grows in hot climates and, although, many countries grow bergamot trees, Italy produces most of the world’s supply of bergamot fruit. Bergamot oil is extracted mechanically with machines called “peelers”. These machines “scrape” the outside of the fruit under running water to get an emulsion channeled into centrifuges for separating the essence from the water. There has been much research into the health benefits that bergamot essential oil provides. These studies have shown that bergamot essential oil has antimicrobial, anti-inflammatory, and analgesic properties, as well as, having a calming effect on the mind and helping to improve mood.1 Bergamot oil is also one of the best essential oils for allergies. What are the many health benefits that bergamot essential oil can give? Let’s have a look at them and how you can use this essential oil. Stress has become a major factor in most people’s lives and, although, some amount of stress is normal, when it becomes too much it can lead to more serious mental and health issues that I’ve mentioned in my article on how stress affects your body. Bergamot essential oil is a popular remedy in aromatherapy to relieve stress and mood disorders and it is one of the best essential oils for anxiety and depression. One of the widest uses of bergamot essential oil is as a powerful anti-bacterial agent. That is one of the reasons why bergamot essential oil is widely used in making soaps. Bergamot essential oil has the power to kill off bacterial infections of the intestines, kidneys, colon, and urinary tract. One study published in the Journal of Applied Microbiology found that a citrus oil blend which included bergamot essential oil killed off the bacteria Enterococcus faecium and Enterococcus faecalis – the bacteria which causes urinary tract infections, endocarditis (an infection of the heart’s inner lining), and meningitis.7 It is interesting to note that E. faecalis is becoming more resistant to antibiotics. Fungal infections on the skin can show up as athlete’s foot, ringworm, candida, and nail infections. The anti-fungal properties of bergamot oil have been shown to inhibit and kill off fungal growth and it is an effective topical treatment for fungal infections. The Journal of Antimicrobial Chemotherapy published a study on the effects of bergamot essential oil and found it to be just as effective as medications commonly used to treat fungal infections.8 The good news is that there were no reported side effects from using bergamot essential oil as an antifungal treatment. So, if you have a headache, sprain or other types of pain for which you would usually take analgesic pain killers, then try rubbing some bergamot essential oil mixed with a carrier oil on the affected area. You can also try other essential oils with analgesic properties which I mentioned in my article about the top 16 essential oils to relieve pain and inflammation. There are also promising results on the use of bergamot essential oil in helping cancer patients cope and treat cancer. Scientists were able to show that bergamot essential oil has proven anticancer activity and they were also able to use methods to make bergamot essential oil more efficient in killing off cancer cells.10 Their study also said that bergamot essential oil compounds have been used to help treat breast cancer. Statins are often used by doctors to control cholesterol levels and lower the risk of heart attack and stroke, however, there are many unpleasant side effects associated with taking them. Taking an extract of bergamot has been shown to reduce the dose of statins needed to control cholesterol. The International Journal of Cardiology published a study showing that bergamot extracts increased the effectiveness of statin therapy, therefore resulting in a reduction of the dose of statins.12 During the one-month study, the amount of cholesterol in the blood was reduced by around 30%. Because bergamot essential oil is a powerful antifungal, antibacterial, and anti-inflammatory agent, as well as having a pleasant smell, there are a number of other ways that you can use it. Helps the digestive system – by mixing a few drops of bergamot essential oil with a carrier oil (such as jojoba oil or sweet almond oil) and then rubbing it on your stomach, can help you ease digestive problems and excess gas. Abdominal massage has many benefits, and adding bergamot essential oil will enhance these effects. Bergamot essential oil benefits the skin – due to its anti bacterial properties, bergamot essential oil can also help your skin look great and healthy. You could add a few drops of bergamot essential oil to a tablespoon of carrier oil and use it to treat acne or other skin infections or if you have an oily skin. If you suffer from acne. You can also use other essential oils for acne. Natural deodorant – you can also use bergamot essential oil to kill off odors. For example, you can add a few drops to this homemade deodorant, or to this natural coconut oil deodorant. You can find more natural home remedies to get rid of underarm odor in my previous article. Air freshener – in a spray bottle mix together water and a few drops of bergamot oil and other of your favorite essential oils to create a natural air freshener. Shake well before each use. Or use bergamot essential oil in a diffuser to freshen the air while creating a soothing atmosphere. Or you can add it to other health boosting essential oil recipes for your diffuser. Relieves congestion – bergamot essential oil can also help relieve cold symptoms. You can place a few drops on the palms of your hand, rub them together, cup your hands and then place to your nose and mouth and breathe in the vapor. Or you can add a few drops to a steam vaporizer. For more ideas, read my article about the best essential oils for cold and sore throat. Because essential oils are very concentrated, don’t use bergamot essential oil directly on the skin without diluting it first with a carrier oil like coconut oil, sweet almond oil, jojoba oil, or olive oil. You can also make your own refreshing Earl Grey tea using some bergamot essential oil. It is suggested to make black tea as usual and then dip a toothpick into the bergamot essential oil. Remove the excess oil from the toothpick by wiping it on the inside of the bottle’s neck then use the toothpick to stir your tea. You can use some trial and error to reach your perfect taste. Bergamot essential oil is generally safe for use; however, it contains bergamottin and bergapten which can increase photosensitivity. This means that it can increase the risk of skin damage because of exposure to the sun. If you have applied bergamot oil, make sure to wear sunblock with a high SPF factor or cover up. 6. J Applied Microbiology 2006 Dec.
7. J Applied Microbiol. 2009 Apr. 12. International Journal of Cardiology.